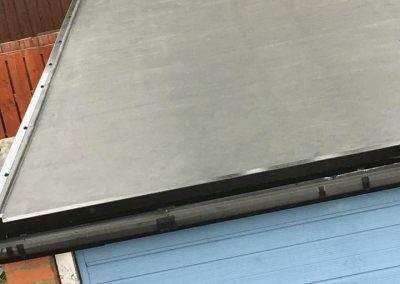 Ethylene Propylene Diene Monomer is more commonly known as EPDM which is rubber flat roofing and is an extremely popular modern alternative to only having wooden, old asphalt, insulated or concrete roofs with no protection. 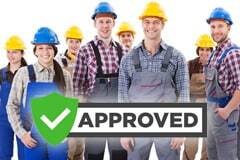 Many of our customers have it installed for garages, extensions or conversions on the sides of their homes. By installing rubber insulation on your roof it will prevent water from leaking through the roof. 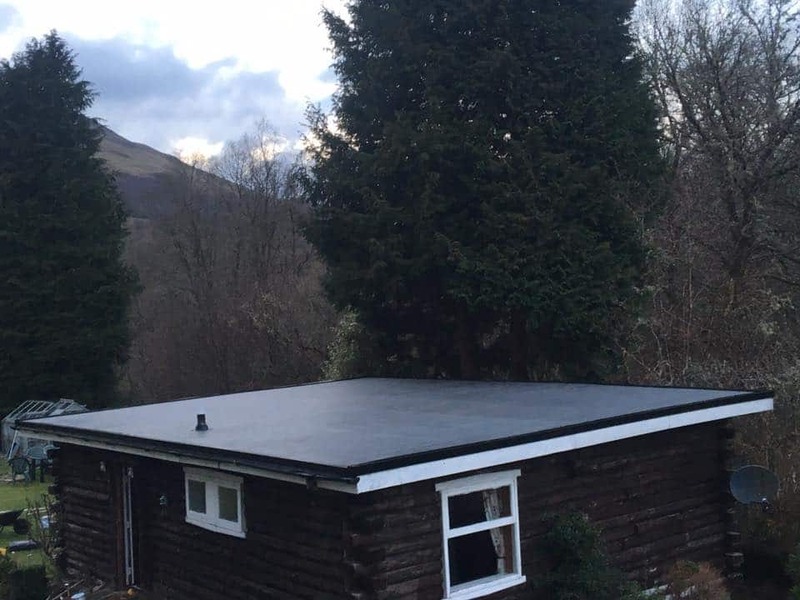 We recommend to all of our customers the use of rubber EPDM material on any flat roofs being installed, the quality of our materials and our experience with fitting them makes it an even more appealing choice. EPDM is 100% waterproof which has always been a huge issue for traditional asphalt and felt roofs especially. Green mineral felt roofs or felt roofs in particular, this is a huge problem which is referred to as pudding. 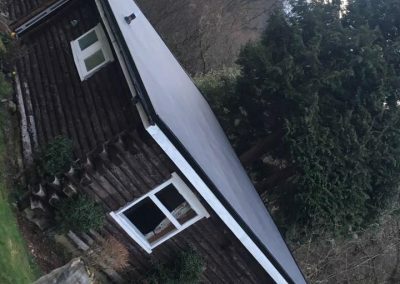 Pudding allows water to penetrate the surface layer of your roof, then water pours from any leaks and gets between the gaps in the rest of your roof and you have a problem. 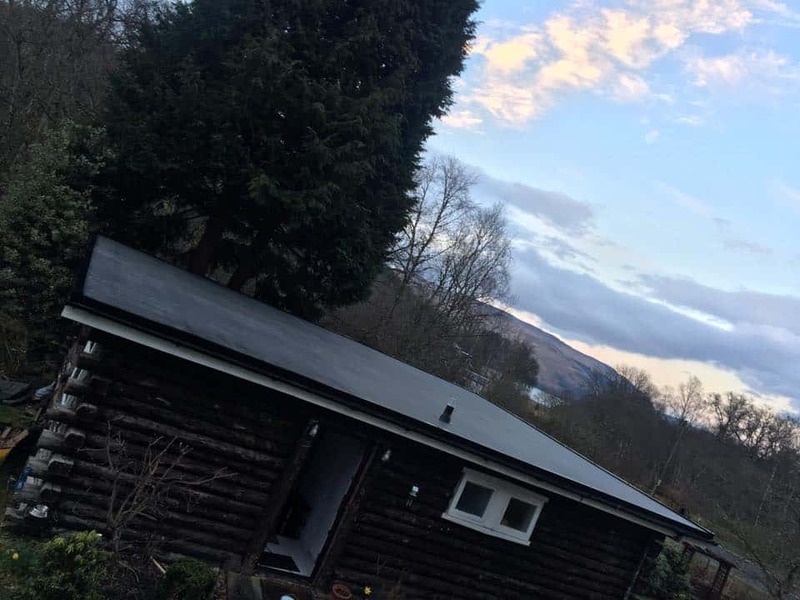 We installed a new rubber firestone flat roof in this beautiful little log cabin just outside of Glasgow. 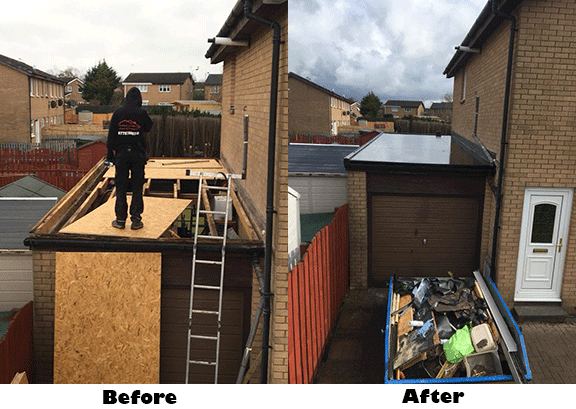 The first picture shown of the four shows you how it looked before the flat roof installation and we think you will agree that the difference between the before and after is very noticeable. More importantly other than being aesthetically pleasing is that is secured and built to last coming with a full guarantee for the next 25 years. 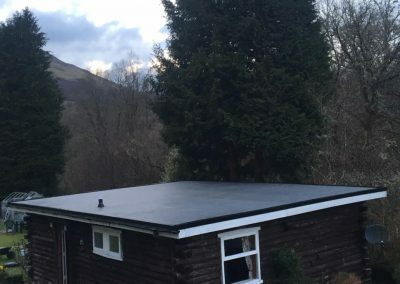 Following our usual process when installing rubber firestone flat roofs we stripped the roof back and sheet it with 18mm of sterling board. 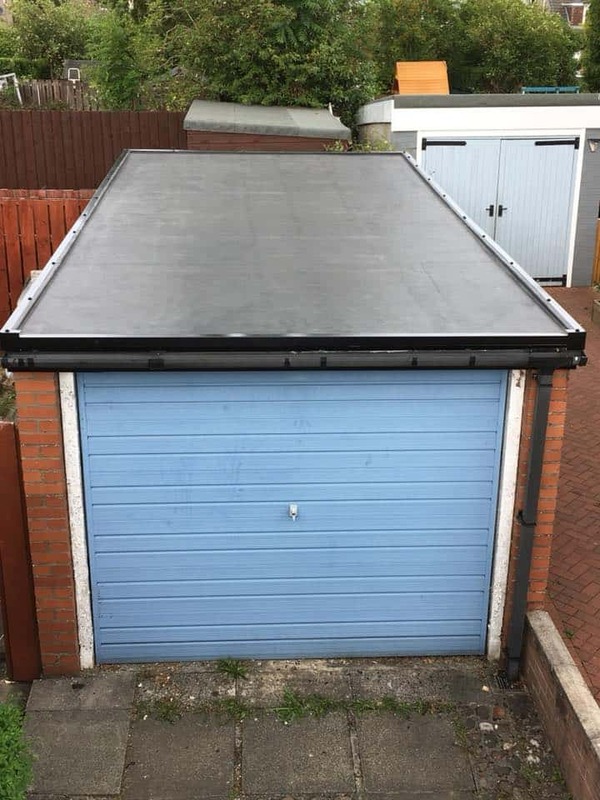 The roof was then bonded with Firestone using a strong adhesive and then towards the end of the job we finished it with black drip and black gutter trims. 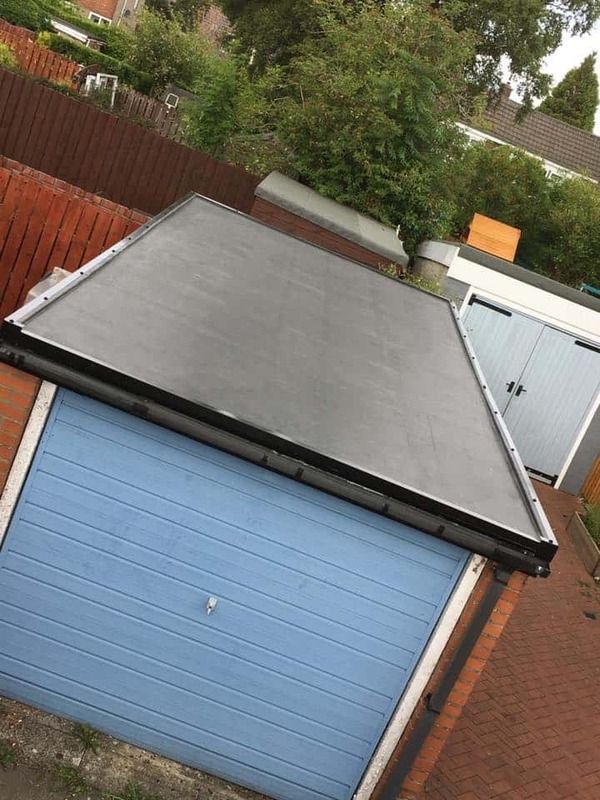 Pictured below is an EPDM firestone flat roof we completed in Bearsden, North Glasgow this is a specialist area of roofing for Collins Roofing & Solar Solutions, we have installed dozens of flat roofs for Glaswegians who were looking for a roofing company who can remove the felt or asphalt and have some rubber installed instead. 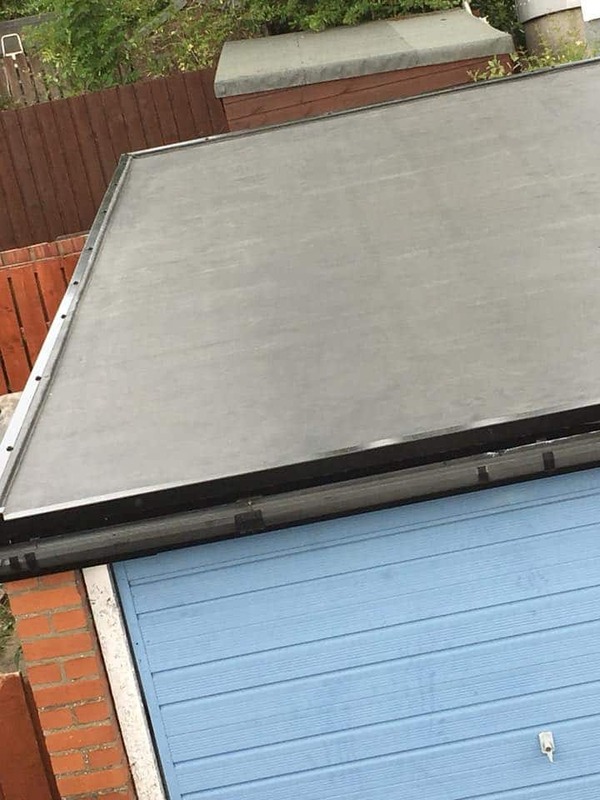 A large percentage of the people who contact us are looking to have a flat roof fitted in their home, garage roofs or elsewhere on their property. 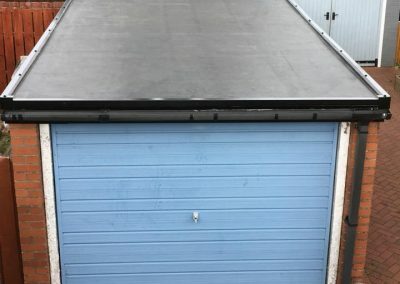 For this particular flat roofing contract completed in Bearsden, we used 18mm of STERLING board before fully bonding the roof together using asphalt and adhesive which was completed with a black facia & black gutter drip trims. 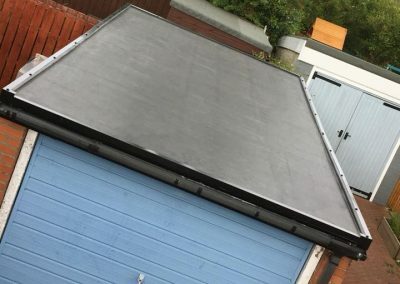 Every single flat roofing contact completed by Collins Roofing & Solar Solutions comes with a 20-year firestone guarantee which also comes with a 50 year product guarantee. 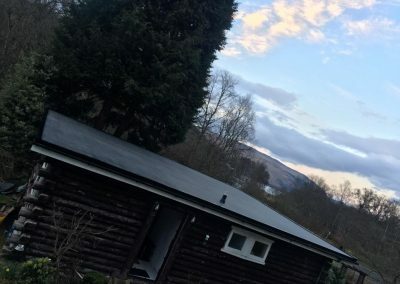 All of the roofers who work for Collins Roofing & Solar Solutions are locals from the Glasgow area, they are fully trained and well-practiced firestone flat roof installers. 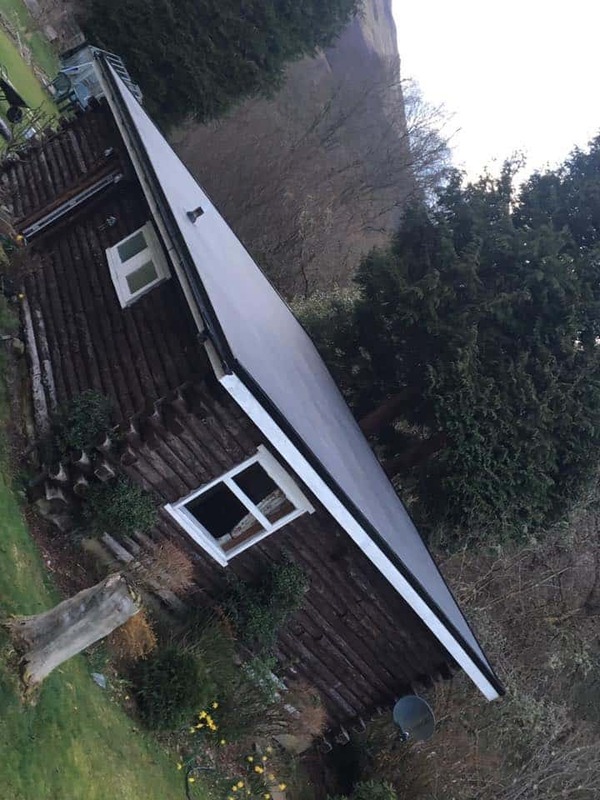 * When we completed our consultation with this customer we established the old felt had perished and the roof was leaking water and allowing wind through. * We then fully stripped the roof fully and fitted 18mm of OSB board. * Before bonding made to measure rubber. 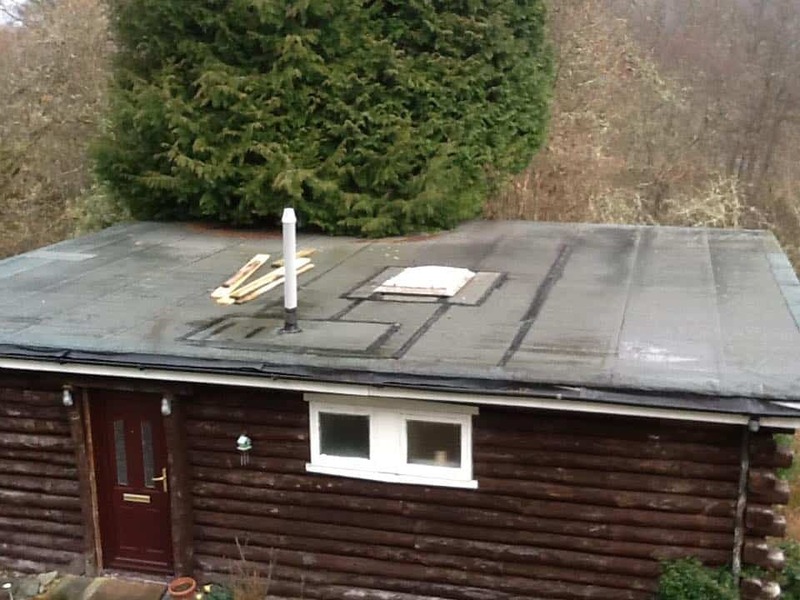 * Completed with drip and gutter trims around all the edges for a tidy finish. 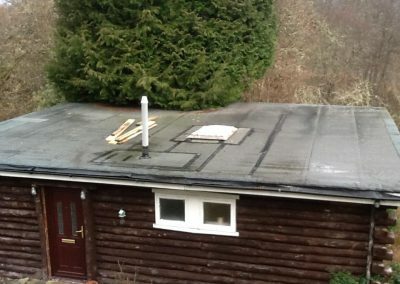 * 25 year guarantee on firestone roofs and as you can see from one of our many before and after pictures it looks great!